As I mostly only paint Christmas items, it is only natural that I have Christmas items to give away so more than likely each of my giveaways will be Christmas oriented. I might surprise ya and throw in a Halloween or fall item. Depends on my mood. 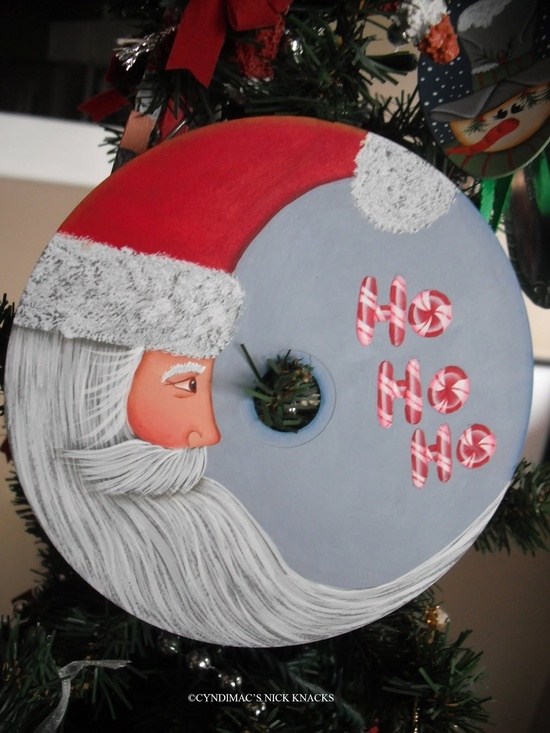 LOL This first giveaway is a handpainted CD ornament with my fave thing to paint, Santa Claus. I just love crescent moon santas and this is my first that I am offering. Come on out and play! 1. Must be a follower of my blog; new followers are welcome to participate. I will be drawing the name of the winner and notifying them on March 31st and the package will go out shortly thereafter. 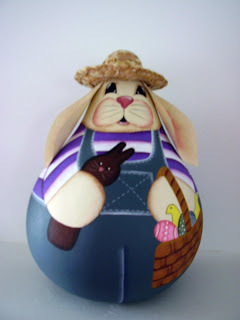 Although anymore I don't paint much else than Christmas things, here are a few Easter things I painted in the past. I used to participate in craft swaps with some of my online painting friends years ago and most of these were parts of those swaps...what fun that was! I do love painting on gourds and I have quite a few that are laying there waiting on me to get to them. Hopefully some time this year I will get to those...stay tuned!